French wonder-kid Ousmane Dembele shrugged off comparisons with Neymar and insisted he still has much to learn, despite becoming the second most expensive player in history as he was presented by Barcelona on Monday. The 20-year-old’s 105 million-euro ($125 million) transfer from Borussia Dortmund could rise to 145 million with add-ons depending on his performance, as Barca splashed out to fill the gap left by Neymar’s own world record 222 million-euro move to Paris Saint-Germain. “I’m not here to replace Neymar,” said the Frenchman. Dembele will form a fearsome forward line alongside five-time World Player of the Year Lionel Messi and Luis Suarez as Barca aim to wrestle the Champions League and La Liga titles back from rivals Real Madrid. And Dembele expects to learn firsthand from Messi, who he described as the best player in history. “It’s an honour to be a part of Lionel Messi’s team,” added Dembele. “He’s a great player, the best player in the world, the best in the history of football and I am very happy to play in his team. Dembele’s Barca career got off to an inauspicious start as his presentation in front of 18,000 waiting fans at the Camp Nou was delayed for nearly two hours due to a paperwork issue in releasing his registration from Dortmund. With the supporters’ patience tested there were whistles during the delay and chants for Barca president Josep Maria Bartomeu to resign. Barca’s board has been under huge pressure due to the club’s fading fortunes on the field and being caught cold by Neymar’s decision to leave. The attendance was also well down on the 50,000 fans that welcomed Neymar on his presentation four years ago. “With a player like Ousmane we have a competitive team that can aim, like every year, for the greatest success,” said Bartomeu. Dembele finally emerged in Barca’s famous red and blue strip, sporting the number 11 jersey vacated by Neymar. However, he will have to wait until at least September 9 to make his debut when Barca host Espanyol in a Catalan derby. 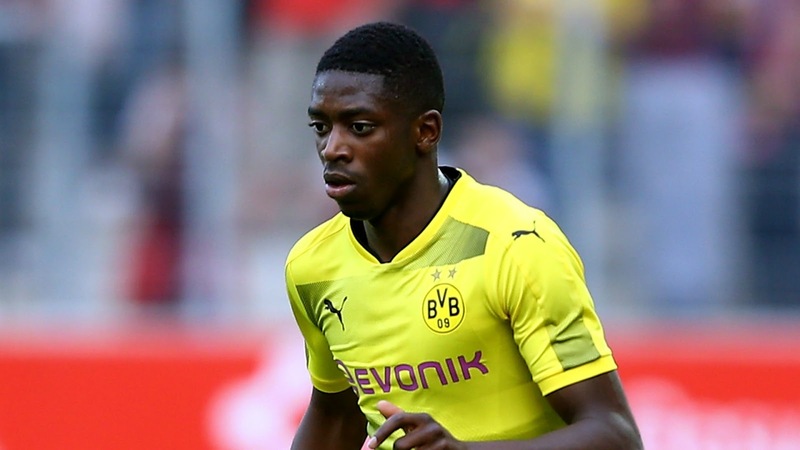 Dembele announced himself as one of Europe’s top prospects with a stellar season at Dortmund, scoring 10 goals, after joining from Rennes for just 15 million euros a year ago. However, he had been suspended by Dortmund since he boycotted training on August 10 in protest after the German club rejected Barca’s first bid. Dembele becomes Barca’s fifth signing of the summer after Marlon Santos, Gerard Deulofeu, Nelson Semedo and Paulinho. And the Catalan giants intend on completing at least one more deal before the transfer window closes on Friday with Liverpool’s Philippe Coutinho top of their wish list. Coutinho, 25, hasn’t played for Liverpool since submitting a transfer request to try and force through a move earlier this month. “My intention is that another player will come, if possible two,” said Barca sporting director Robert Fernandez.